Opal Peachey has said “I’m a shoot off of Circus Contraption. It was great because they eventually wrote parts specifically for me.” but she is more than that. 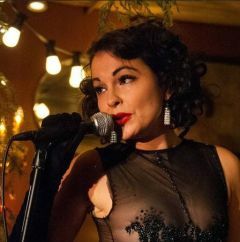 A native Washingtonian, a Cornish graduate and a company member of Café Nordo, she is also a cabaret artist, an actor and a singer. A Seattle treasure, if you’ve never seen Opal Peachey, if you’ve never seen Nordo Cafe, why not join us when Moisture Festival snuggles up with that crowd in their venue … yum.